Join us anytime of the year! Volunteer hosts live in their own RV, motor home, or trailer, at a special camp site. Some housing may be available on a first come first serve basis. Alaska State Park campgrounds are rustic, but clean and beautiful. Each campsite has a parking pad, a picnic table, and a fire pit. Each campground has water, latrines, and refuse containers. Some host locations have access to telephone and electricity. The campgrounds are near recreation attractions – lakes, streams, mountains, fishing, and wonderful views. Campground hosts stay free in an Alaska State Park campground and have free use of all facilities. Each host or host couple will be trained and will receive a Lifetime Adventures uniform. Hosts receive from $9.80 per hour. Campground attendant: help with the day-to-day operation and maintenance of campgrounds, including litter patrols, light janitorial maintenance, and repairs. Special park projects can be designed based on a host’s skills and interests. All hosts must have enthusiasm for working with the public, a willingness to learn about Alaska, and the desire to accept new challenges. Also included in this job is helping the guide prepare the trip; heavy lifting is required. Some housing may be available on a first come first serve basis. Attendants receive from $9.80 per hour. Lifetime Adventures has three rental locations. Our Anchorage location is located in downtown Anchorage at 440 L street and offers bike rentals. The Eklutna Lake rental cabin is located at the beginning of the Lakeside Trail at Eklutna Lake state park and offers kayak and bike rentals as well as guided trips and basic kayak lessons. Our newest location is at the base of Hatcher Pass in the Matanuska Susitna borough and offers bike and facility rentals. This location is open year round and also offers fat bikes, skis and snowshoe rentals during the winter. The rental center staff must have knowledge of mountain biking and be able to perform minor repairs to equipment. 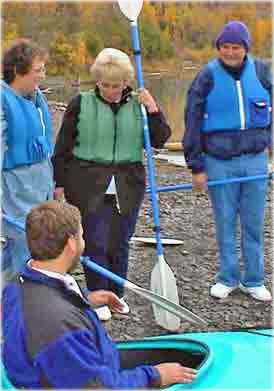 For our Eklutna Lake location you will be teaching basic kayak skills and leading groups on water and bikes, so prior experience is suggested.